Everything runs smoothly on Windows 8.1 with Frodo 12.3. @bitcrusher01 thanks for the SKY.FM plugin!!! I've installed the plugin a few weeks ago (v3.04) under XBMC Linux (v12.2). The free stations played no problem. 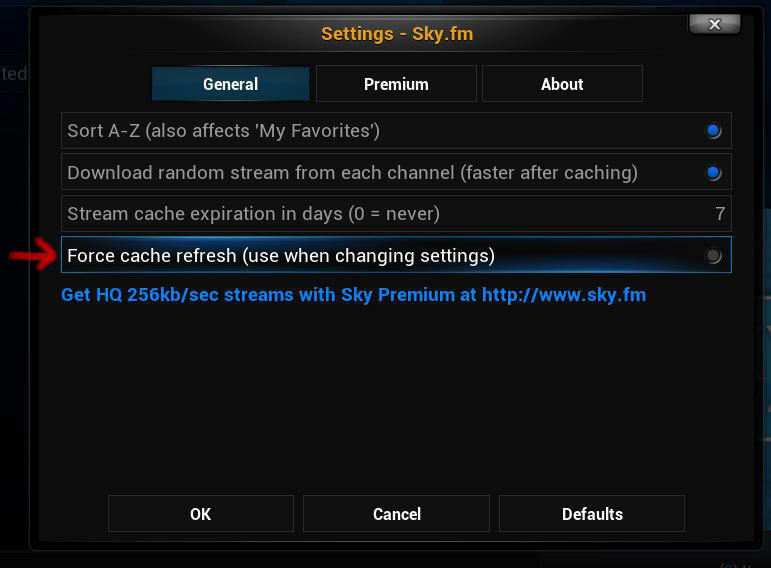 Now I have a SKY.FM premium account. I've configured the plugin with my premium account credentials but it will not connect - it still plays the free stations that have commercials. I even tried entering bogus premium account credentials expecting an error but it just plays the free channels. @blueflash: I've heard that it does not work in general in the UK - does the website or mobile apps work for you? I think it's something they (DI.fm) had to do in their end, because of UK laws. I suppose you'll want to see logfiles. Where are they stored in Linux? 17:52:57 T:2899303232 NOTICE: Previous line repeats 1 times. I printed my username and password to the logfile and they are correct. Not sure where to go from here. FYI, my premium account is a 7-day trial that hasn't expired yet. Could that be the problem? I had the exact same problem and symptoms as BWNautilus. The fix that he posted worked for me too. Sorry for not checking in with this thread, for some reason I don't get notified when new posts are made, despite being subscribed. (2014-04-12, 23:28)bitcrusher01 Wrote: @blueflash: I've heard that it does not work in general in the UK - does the website or mobile apps work for you? I think it's something they (DI.fm) had to do in their end, because of UK laws. - The Duration time indicator is cumulative so it shows how much time has played for all songs you've listened to for that session not just the time of the current song. - The Remaining time indicator stays at -00:01 and constantly flashes. Is this normal or should they show duration and remaining time specific to each song played? My main gripe is that the time remaining indicator flashes which is distracting. I have the same problem. No channels in sky.fm and di.fm. This is only recently because it worked perfectly. I have tested it with premium account and free account. Also removed the settings (userdata) but still nothing. Tried it on different boxes and also nothing. The problem is the refresh/force refresh. I uploaded a old userdata which worked but after a refresh the list was gone. Sorry guys, I pushed v3.0.6 Sunday, but forgot to update this thread and post about. As of 7/1/2014.still getting "ONE OR MORE ITEMS FAILED TO PLAY"